We started at North Lake in Golden Gate Park. It was dark and cloudy for a mid-day, and cold raindrops occasionally sprinkled on our heads. Birds were mostly quiet along the south side of North Lake, an American Coot here, a Mallard there, and a bunch of squirrels, anxious for a snack. Judging from the peanut shells strewn all over, these fellows are quite accustomed to handouts! A couple of Allen’s Hummingbirds (presumably – I suppose they could be the quite-similar Rufous Hummingbird) zipped high into the air and plunged with a popping sound, and a Great Blue Heron stood stoically across the lake. A pair of Downy Woodpeckers hammered a nearby tree, and gave us a few nice looks before flying off. Had I brought my SLR, I could have captured a nice photo, but the light was low and dull, so I’d left it at home. We walked toward the municipal golf course, seeing only Dark-eyed Juncoes and a few Golden-crowned Sparrows, then continued around North Lake, now on its northern side. A trio of Mew Gulls floated in the middle of the lake, a Steller’s Jay skulked in a dense stand of bush, and the local Common Ravens croaked and cronked in their low, rattling voice. More common denizens of these parts presented themselves, including Ring-necked Ducks, more Mallards, a lone Pied-billed Grebe, more coots, and some Ruddy Ducks, including one looking very spiffy in his freshly-grown alternate plumage and bright blue bill. Little else was showing itself, so we wrapped it up and decided to check out Sutro Baths to see if the oft-reported Burrowing Owl was at its place in the rock wall. After parking across the street from Louie’s restaurant (which proves the adage that the quality of the food is inversely proportional to the niceness of the view), we walked down the path toward the ruins of Sutro Baths, then turned and looked up at the rock wall to the left of the restaurant and scanned and scaned some more, but no Burrowing Owl did we see. Ah well…. We continued on to the parapet overlooking the bay and enjoyed the nippy stormy weather and pretty views. Few birds were to be seen, a few Western Gulls, some Brandt’s Cormorants, and that was about it. Below and distant, in the old bathing pool was a Bufflehead and a few coots, nothing worth walking down to check on, and the rocky shore appeared devoid of shorebirds, so we decided to call it a day and head on home. Although we didn’t see too much, it’s always a pleasure to get out, and I did nab 5 more year birds, this due more to my having not been out too terribly much more than the presence of anything out of the ordinary for this time of year, but hey, I’ll take them! True that! 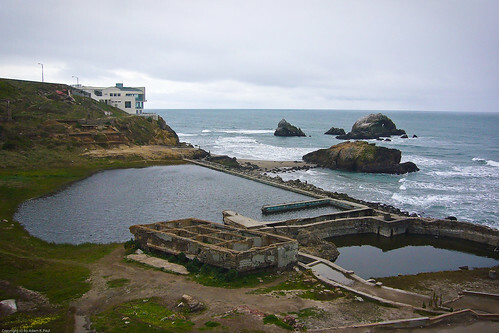 Sutro Baths is one of my favorite places to bird, walk around, or just contemplate.